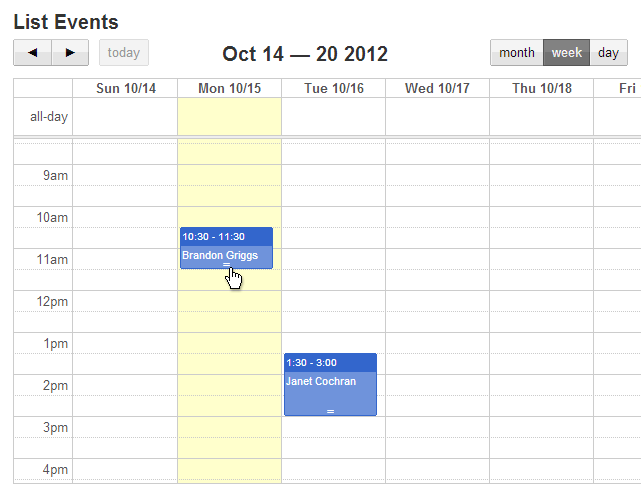 We’re pleased to release a major new feature for Knack- a calendar view! A calendar was one of our most requested features. It can enable great online database and web apps like online scheduling. Click on events to view and edit details. Let us know if you use the calendar in your own online database or web app. We want to see it in action! Today we released a new example app: an online database displaying government funding. We think this is a great example of how local, city, and state governemnts can use Knack to make more government data accessible to their constituents. Knack apps can be embedded directly on government websites and look completely integrated. Knack apps can handle millions of records and still be extremely fast. Databases of this size are difficult to keep speedy in traditional non-cloud IT systems. Knack apps are extremely cost efficient and can unlock data for constituents that might otherwise not be available. If you’re considering adding online database apps for your government, please contact us and let us know how we can help. Records Search: a tax advisor from India is using Knack to enable users to search for critical bank and tax codes in an online database with over 80,0000 records. Volunteer Management: a hospice agency is using Knack for a volunteer database app. They track the locations and hours for each volunteer and run reports on total hours and estimated value. Inventory Managment: a restaurant and club is using Knack to manage their food inventory. They track inventory levels for each product and generate reports for products that need to be re-ordered. Book Search: a synagogue uses Knack so members can use a tablet to search all the books in their library. As always we’re astounded by the variety of these great apps! We are thrilled to announce a major new feature we’re really excited about: inline editing for tables. Clicking on a cell immediately brings up a form to edit it. Inline editing is a perfect match for certain web applications. Think of any inventory app where someone is updating inventory with a tablet. You’ll have to continually be clicking on a product record, having it load an edit form, updating the inventory, hitting submit, clicking back to select another record…. that’s a lot of steps. 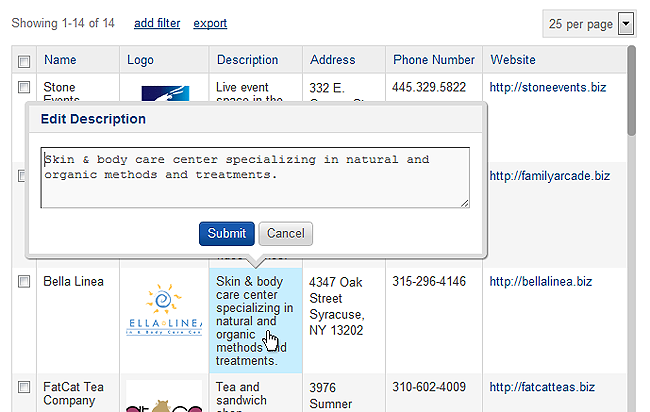 With inline editing you can directly edit a cell with just a few clicks and with no reloading. This can really add up for certain applications. What can you build with Knack? Claiming that Knack enables anyone to build their own web application and online database is a bit like magic. After all, your definition of a web app could be incredibly creative, or just much different than ours. So we want to start listing examples of different web apps built by Knack. This should help present an idea of the type of apps that work well with Knack and may even provide some use cases very similar to what you’re looking for. We’ll be listing apps in two main areas: a Demo Library with plenty of working examples you can play with; and a Current Apps tag here on this blog where we’ll describe actual apps built by Knack users. Talent Database – A talent agency is using Knack to manage all of their models and actors in an online database. The models can update their own information leading to more accurate and timely info, and using filters makes searching through thousands of models a breeze. Class Management – A dance studio is using Knack to manage all of their classes and students in a single web application. Parents can register for classes directly online and reports on classes and contacts can easily be generated. Inventory Management – A cattle ranch is managing all of the animal inventory online. Weights are frequently imported a reports can be generated to track all inventory counts. Customer Database – An IT consultant tracks their customers so they can easily pull up any server and computer info on a job, make notes, and generate invoices.